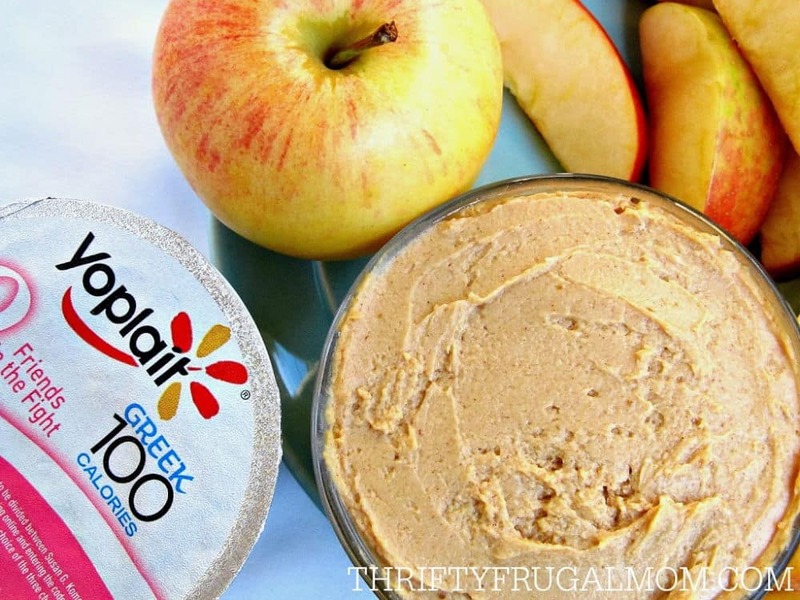 Whip up this easy 5 minute peanut butter yogurt fruit dip for a quick snack! It’s delightfully creamy and pairs perfectly with apples, bananas, graham crackers or pretzels. I don’t know how your kids are, but most days our 7 yr. old comes home from school ravenously hungry! In fact, it’s not uncommon for him to greet me with, “Hi, Mom!” and in the same breath ask, “What can I eat?” And if the other two children are up from their naps, they of course want to get in on snack time too! Obviously, the challenge for me as a mom is to keep healthy snack options on hand for them all. Lately we’ve had a lot of apples thanks to my in-law’s, so most afternoons that’s what I’ve been giving to them as a snack. While they love apples, they were kind of getting tired of the same thing over and over. So one afternoon, I got the idea to change things up a bit by creating a simple healthy fruit dip with some Yoplait Greek 100 that I picked up at Walmart. I wanted something that would be quick to make, yet wholesome and delicious too. We love peanut butter and since it pairs perfectly with apples, I added that to the yogurt, along with some honey to lightly sweeten it. Then I mixed in just a little bit of cinnamon, because I love the warm flavor that it gives. The result was a delightfully creamy easy fruit dip that I had to keep myself from eating straight off the spoon! 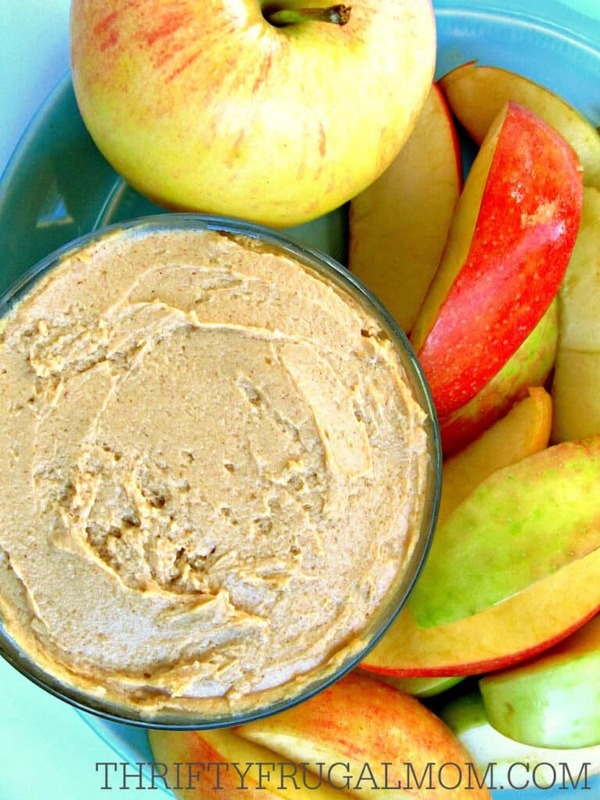 And once I introduced this Healthy Peanut Butter Yogurt Fruit Dip, I had no problem getting the kids to eat apples again. The only issue I ran into was trying to convince my son that it really did need to be eaten as a dip and not all by itself! My 3 year old taste tester approved of the dip too. I had to laugh, because initially when I was playing around with ingredient proportions, I only added ½ tbsp. of honey. When she took her first bite, she wrinkled up her little nose and declared it “not very good”. I figured it was probably just a tad too tart for her liking, so I added an additional tbsp. of honey and gave it another try. Sure enough, that did the trick! After her first bite of the sweeter version, she nodded her head and emphatically told me that it was “really good, Momma!” and immediately wanted more! While this dip works perfectly for fruit, I also discovered that it is delicious with graham crackers and pretzels too. And while we haven’t had a chance to try it yet, we all thought that it would be perfect as a spread on toast as well. Whether you use it as a dip for fruits or decide to try it with something else, I think you’ll declare this easy yogurt fruit dip “very good”! This easy yogurt fruit dip takes just 4 ingredients and is a great healthy dip recipe! Combine all ingredients in bowl; mix until combined. Serve with fruit, graham crackers or pretzels. This sounds so yummy! Do you think a big batch of this would store well in the fridge? Also what if I did it with plain greek yogurt instead of vanilla? I figure since my peanut butter is the honey nut kind plus a little extra honey would balance out the tartness of the greek yogurt. I think a big batch would store fine- basically it should be okay at least until the yogurt's expiration date. And yes, you most definitely can use plain Greek yogurt instead. Like you said, adding a little extra honey should help sweeten it to perfection. :) Enjoy!